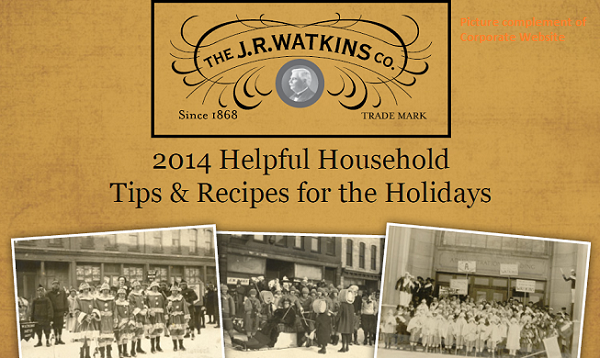 The 2014 Helpful Household Tips & Recipes for the Holidays is a creation of JR Watkins the same company who has been bringing You Quality Products, as well as Tips and Recipes for the past 146 Years! These recipes and hints have assisted Families for Generations, every since 1868. This, the 2014 Helpful Household Tips & Recipes for the Holidays is sure to be treasured by those looking for classic recipes, new ways to prepare meals using flavorful spices, or tried and true cleaning tips. We hope you enjoy this collection of both nostalgic and new recipes, and helpful hints, which have stood the test of time, just like J.R. Watkins and Watkins Products. Enjoy your holidays, the Watkins Way!